JESUS IS CLEAR ABOUT MAKING DISCIPLES ARE WE? The character of Jesus Christ looms large in the history of the world. This one man has influenced more people and cultures than anyone else. Was Jesus a mythical figure? Are the Gnostic gospels better sources for Jesus than the New Testament Gospels? Where was Jesus during his "lost years"? Did the "Jesus family tomb" belong to Jesus Christ? Is Jesus just one of the world's many religious founders? Did the early church twist the Old Testament to support its claim that Jesus was the Messiah? 14 panels, fits inside most Bibles, 8.5 x 5.5 inches, unfolds to 38 inches long. The Evidence for the Resurrection Pamphlet answers the common questions that skeptics ask about the death and resurrection of Jesus Christ. For example, Was Jesus a real person? Is there evidence that he rose from the dead? Can you trust the witnesses? The bestselling Evidence for the Resurrection pamphlet answers each question, and addresses each theory with historical, archaeological, and cultural evidence. 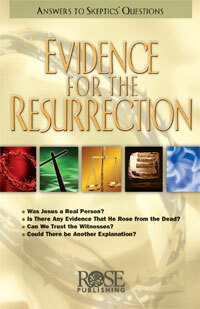 This 12 panel pamphlet, which can be read in half an hour, presents evidence and logic that has convinced critics over the years and will equip you to with the right information when you talk to someone who questions the resurrection story.Evidence for the Resurrection Pamphlet is perfect for Easter, Resurrection Sunday, discipleship, new members, confirmation, and outreach. Evidence for the Resurrection addresses 11 common objections and theories held by skeptics. For each of the objections and theories, Evidence for the Resurrection provides an answer from eyewitnesses who wrote the Scriptures, historical Church documents, and ancient archaeology records, among others. The evidence in this short pamphlet will cause even long-time believers to celebrate the glory of the resurrection with each reading. Evidence for the Resurrection also includes a one-page answer to the question, "What is the Resurrection?" and a page of "Closing Statements," that includes additional evidence that Jesus lived, died, and was resurrected from the dead. Additional references are also provided. Is the Bible full of made-up stories or is there evidence for the people, the places, the customs, and events mentioned in Scripture? In 50 Proofs for the Old Testament you will find solid evidence that supports the trustworthiness of Old Testament Scripture. 12 panels, fits inside most Bibles: 8.5 x 5.5 inches and unfolds to 33" long. 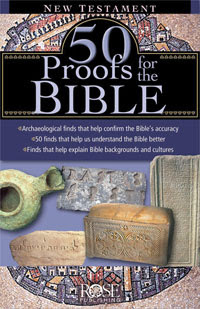 A companion piece to 50 Proofs for the Old Testament is 50 Proofs for the New Testament which examines archaeological and other proofs regarding the legitimacy of New Testament people and events. Both pamphlets are excellent resources for Bible studies or for anyone who has questions about the accuracy of Scripture. Is the Bible full of made up stories or is there evidence for the people, places, customs, and events mentioned in Scripture? In 50 Proofs for the New Testament you will find solid evidence that supports the trustworthiness of New Testament Scripture. 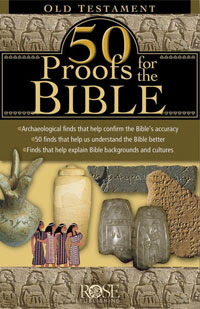 A companion piece to 50 Proofs for the New Testament is 50 Proofs for the Old Testament which examines archaeological and other proofs regarding the legitimacy of Old Testament people and events. Both pamphlets are excellent resources for Bible studies or for anyone who has questions about the accuracy of Scripture. Now this may be a shock to many but Jesus is revealed in and fulfilled 100+ prophecies in the Old Testament. 100 Prophecies Fulfilled By Jesus gives a list of more than 100 prophecies Jesus fulfilled that had been foretold in the Old Testament 400-1500 years before his birth. This bestselling pamphlet includes a chart comparing the Old Testament prophecies that relate to Jesus' birth, life, death, and resurrection with the New Testament fulfillment. 100 Prophecies Fulfilled By Jesus contains a helpful chart that presents prophecies divided by topic: "Jesus' Birth," "Jesus' Life and Ministry," and "Jesus' Death and Resurrection." The side-by-side comparison allows you to clearly see the Old Testment prophecies in red type and the New Testament fulfillments for each prophecy. 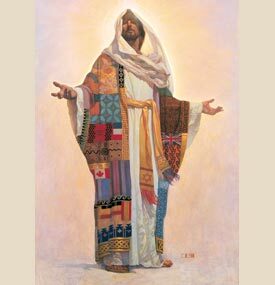 Also included are "Jesus' Titles and Attributes" mentioned in both Old and New Testaments. 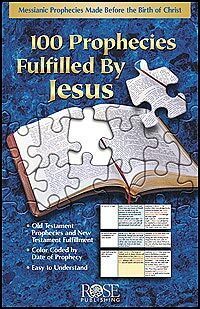 100 Prophecies Fulfilled By Jesus makes an excellent Bible study or reference tool and will help you share the amazing story of the Old Testament's promise of the Messiah's coming and the New Testament's glorious fulfillment of those promises. Old Testament References: Genesis 49:8-10, "Judah, your brothers will praise you...The scepter will not depart from Judah, nor the ruler's staff from between his feet, until he comes to whom it belongs and the obedience of the nations is his." Old Testament References: Zechariah 9:9, "See, your king comes to you, righteous and having salvation, gentle and riding on a donkey, on a colt, the foal of a donkey." New Testament Fulfillment: Mark l1:1-10, "When they brought the colt to Jesus and threw their cloaks over it, he sat on it...."
Old Testament References-Deuteronomy 21:33, "Be sure to bury him that same day, because anyone who is hung on a tree is under God's curse. 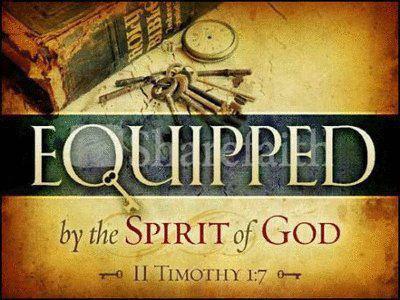 You must not desecrate that land the LORD your God is giving you as an inheritance." New Testament Fulfillment-Galatians 3:13, "Christ redeemed us from the curse of the law by becoming a curse for us, for it is written; "Cursed is everyone who is hung on a tree." 100 Prophecies Fulfilled By Jesus "color-codes" the different Old Testament prophecies so you can see the number of years they were made before the birth of Christ. "You want to know about Jesus' fulfilled prophecies? This is it! [100 Prophecies Fulfilled By Jesus] is laid out beautifully and in a very nice and bold design. 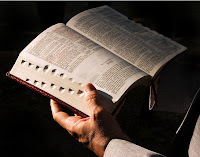 We really should know this material - A quick Bible study guide." Whether you are teaching people with no Bible experience or those who have studied the Bible for a long time, the best-selling How to Study the Bible pamphlet provides an excellent introduction to personal Bible study. This full-color, glossy pamphlet is ideal for teachers who want to provide information on studying the Bible in a quick, easy-to-use format. How to Study the Bible has concise steps for personal preparation, descriptive resources and reference information, and a step-by-step approach for inductive Bible study that teaches students to dig deeper into God's Word. 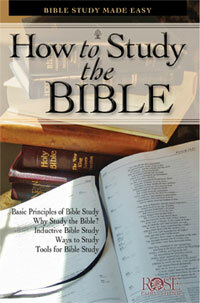 How to Study the Bible shows how to approach Bible studies in an organized and life-touching way. This is Bible study made easy! The content is self-explanatory and is both easy to present and easy to use. Following the Bible study pamphlet, you can learn how to explore the Bible, how to improve Bible skills, how to understand what the Scriptures means as a whole, as well as the Bible's real-life application on a personal level. How to Study the Bible encourages the pursuit of personal study and a deeper, more rewarding experience with God. And the S.O.I.L. (four-step approach) that explains how to dig deeper into the Bible. How to begin using inductive Bible study that asks, What does the Bible teach? rather than How do I prove my opinions by using the Bible? Those who use How to Study the Bible will develop the confidence to read and study God's Word on their own with a new passion. There's really not an easier way to teach others How to Study the Bible. 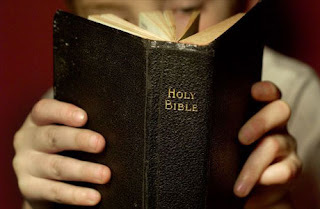 Someone said to me one day after I has taught on trusting the Bible, How Did we get the Bible? This excellent well written and easy to follow pamphlet lays it out well! The How We Got the Bible Pamphlet increases your confidence about the reliability of the Bible. This bestselling pamphlet covers the top 10 facts every Christian should know about the Bible. It includes a timeline of key events that led to the printed Bibles we have today. Stories of key people, including William Tyndale, John Wycliffe, Erasmus, and Johann Gutenberg. Shows the history of Bible versions such as the Wycliffe Bible, the Geneva Bible, and the King James Version, in addition to today's modern Bible translations. How We Got the Bible is an amazing pamphlet that will encourage every believer, and that answer the questions of those still seeking. The pamphlet reveals how the Old and New Testaments were communicated through a variety of forms beginning as early as 1500 BC when they were written on stone, clay and leather, and later on papyrus and fine animal skins. Discover the reasons we can trust the reliability of the Bible, for example, how earliest Bible manuscripts were intricately copied by hand and how ancient texts, such as the Dead Sea Scrolls, validate the earliest manuscripts. Throughout history people have wondered, "What if the Bible was tampered with?" 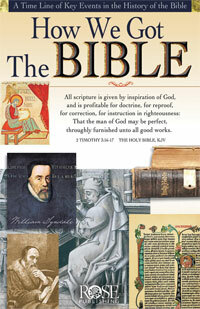 The bestselling Why Trust the Bible Pamphlet reassures Christians that the BibleCAN be trusted. The stories and text were passed down with amazing reliability. And the Bible was hand copied for centuries with amazing accuracy. 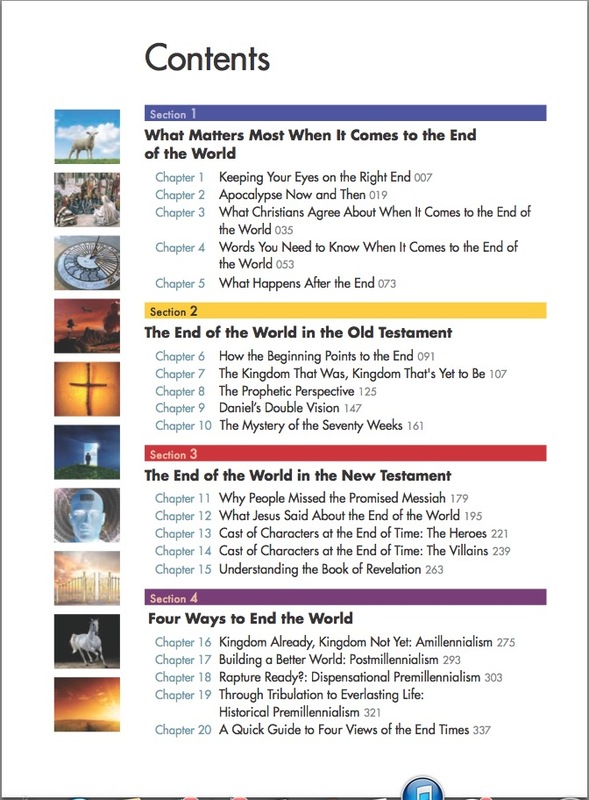 Full color and glossy, this 12-panel pamphlet is an excellent teaching tool for new believers and for those who have questions about the Bible's origin. Author Timothy Paul Jones is a professor at The Southern Baptist Theological Seminary in Louisville, KY. Size: 8.5"x 5.5" unfolds to 33" long. Fits inside most Bible covers. 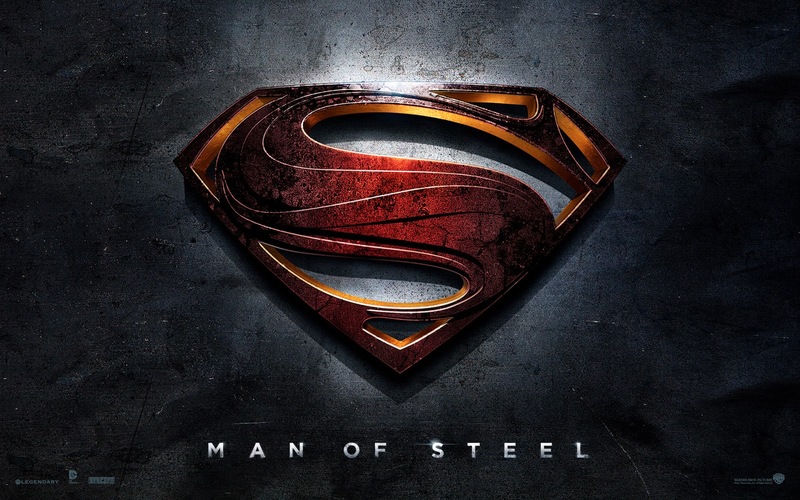 Popular books and movies promote doubts about the authenticity and accuracy of the Bible. Some suggest that the Bible is an ancient document that has been edited so many times that it is now filled with errors. Why Trust the Bible Pamphlet equips believers to defend assaults against the Bible and to defend the faith. In five important questions, the author addresses what the skeptics claim and what history actually tells us. A time line reveals the development of key writings, the emergence of the biblical canon, and more. This great reference tool proves that the Bible can be trusted! 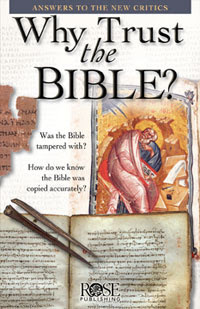 Author Timothy Paul Jones, Ed.D., states without a doubt, "The Bible can be trusted." In clear, concise language, Dr. Jones reveals the errors in the critics' logic and facts, and does it in an easy-to-understand style using helpful charts, time lines, and explanations. False Claim: The Gospels were written long after Jesus lived and were written by people who weren't eyewitnesses. 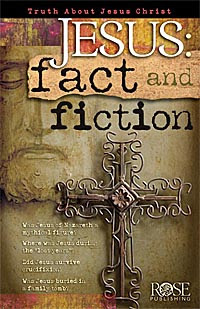 False Claim: The stories about Jesus' life and death were not handed down reliably and not recorded accurately. False Claim: The Bible is full of textual errors, as proven by the Dead Sea Scrolls. False Claim: The New Testament wasn't finalized until hundreds of years after Jesus and his disciples, so there could have been many other "gospels" accepted and later rejected, in addition to the four Gospels found in the Bible today. False Claim: The originals of the Bible are lost; therefore, we have no way of knowing what it actually said. False Claim: The Bible was edited by people who had an "agenda" and changed many teachings. Each of the four Gospels represents eyewitness testimony about Jesus Christ. For example, Mark's Gospel is Peter's testimony and Luke's Gospel is Paul's eyewitness accounts recorded by his physician, Luke. Documents such as the Dead Seas Scrolls and Masoretic texts reveal that biblical texts agree nearly 99 percent of the time. The 27 books of the New Testament that we have today were mentioned in a pastor's letter in AD 367, and were recognized before that date. A time line shows the years of Jesus' ministry shown side-by-side with key writings reflecting witness testimonies. You may Not be Superman but when you are in God's Word daily the Devil is terrified! If you are a Christian your primary Goal in Life is found in the Bible. And we know that God causes everything to work together for the good of those who love God and are called according to his purpose for them. 29 For God knew his people in advance, and he chose them to become like his Son, so that his Son would be the firstborn among many brothers and sisters. 30 And having chosen them, he called them to come to him. And having called them, he gave them right standing with himself. And having given them right standing, he gave them his glory. Don’t you realize that in a race everyone runs, but only one person gets the prize? So run to win! 25 All athletes are disciplined in their training. They do it to win a prize that will fade away, but we do it for an eternal prize. 26 So I run with purpose in every step. I am not just shadowboxing. 27 I discipline my body like an athlete, training it to do what it should. Otherwise, I fear that after preaching to others I myself might be disqualified. Don’t let anyone condemn you by insisting on pious self-denial or the worship of angels, saying they have had visions about these things. Their sinful minds have made them proud, 19 and they are not connected to Christ, the head of the body. For he holds the whole body together with its joints and ligaments, and it grows as God nourishes it. So never be ashamed to tell others about our Lord. And don’t be ashamed of me, either, even though I’m in prison for him. With the strength God gives you, be ready to suffer with me for the sake of the Good News. 9 For God saved us and called us to live a holy life. He did this, not because we deserved it, but because that was his plan from before the beginning of time—to show us his grace through Christ Jesus. And so, dear brothers and sisters who belong to God and are partners with those called to heaven, think carefully about this Jesus whom we declare to be God’s messenger and High Priest. 2 For he was faithful to God, who appointed him, just as Moses served faithfully when he was entrusted with God’s entire house. Hebrews 3:3 But Jesus deserves far more glory than Moses, just as a person who builds a house deserves more praise than the house itself. 4 For every house has a builder, but the one who built everything is God. So let us stop going over the basic teachings about Christ again and again. Let us go on instead and become mature in our understanding. Surely we don’t need to start again with the fundamental importance of repenting from evil deeds and placing our faith in God. In response to Benjamin Franklin's call to seek God that was made on June 28, 1787, the Rev. William Rogers prayed before the service that was held at the Reformed Calvinist Church in Philadelphia on July 4th of that year. 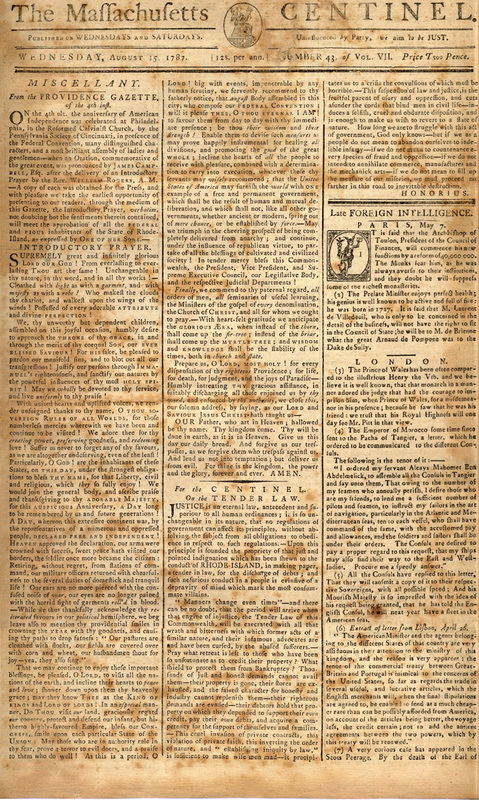 The below text is taken from The Massachusetts Centinel on August 15, 1787. Supremely great and infinitely glorious Lord our God! From everlasting to everlasting Thou art the same! Unchangeable in thy nature, in thy word, in all thy works! – Cloathed with light as with agarment, and with majesty as with a robe! Who maketh the clouds thy chariot, and walkest upon the wings of the winds! Possessed of every adorable ATTRIBUTE and divine PERFECTION! We, thy unworthy but dependent children, assembled on this joyful occasion, humbly desire to approach the THRONE of thy GRACE, in and through the merit of thy coequal SON, our EVER BLESSED SAVIOUR! For HIS sake, be pleased to pardon our manifold sins, and to blot out all our transgressions! Justify our persons throughIMMANUEL’S righteousness, and sanctify our natures by the powerful influences of thy most HOLY SPIRIT! May we wholly be devoted to thy service, and live uniformly to thy praise! That we may continue to enjoy these important blessing, be pleased, O Lord, to visit all the nations of the earth, and incline their hearts to peace and love; shower down upon them thy heavenly grace; may they know THEE as the KING OF KINGS and LORD OF LORDS! In anespecial manner, DO THOU visit our land, graciously regard ourcountry, protect and defend our infant, but hitherto highly favoured Empire, bless our CONGRESS, smile upon each particular State of the UNION: May those who are in authority rule in thy fear, prove a terror to evil doers, and a praise to them who do well! As this is a period, O LORD! big, with events, impenetrable by any human scrutiny, we fervently recommend to thy fatherly notice, that augustBody assembled in this city, who compose our FEDERAL CONVENTION; will it please THEE, O THOU ETERNAL I AM! to favour them from day to day with thy immediate presence; be thou their wisdom and their strength! Enable them to devise such measures as may prove happily instrumental for healing all divisions, and promoting the good of the great WHOLE; incline the hearts of all the people to receive with pleasure, combined with a determination to carry into execution, whatever these thy servants may wiselyrecommend; that the United States of America may furnish theworld with ONE example of a free and permanent government, which shall be the result of human and mutual deliberation, and which shall not, like all other governments, whether ancient or modern, spring out of mere chance, or be established by force. – May we triumph in the cheering prospect of being completely delivered from anarchy; and continue, under the influence of republican virtue, to partake of all the blessings of cultivated and civilized society! In tender mercy bless this Commonwealth, the President, Vice President, and Supreme Executive Council, our Legislative Body, and the respective Judicial Departments! Finally, we commend to thy paternal regard, all orders of men, allseminaries of useful learning, the Ministers of the gospel of everydenomination, the Church of CHRIST, and all for whom we ought to pray. – With heart-felt gratitude we anticipate the GLORIOUS ERA, when instead of the thorn, shall come up the fir-tree; instead of thebriar, shall come up the MYRTLE-TREE; and WISDOM andKNOWLEDGE shall be the stability of the times, both in church andstate. OUR Father, who art in Heaven; hallowed be thy name. Thy kingdom come. Thy will be done in earth, as it is in Heaven. Give us this day our daily bread. And forgive us our trespasses, as we forgive them who trespass against us. And lead us not into temptation; but deliver us from evil. For thine is the kingdom, the power and the glory, forever and ever. AMEN. 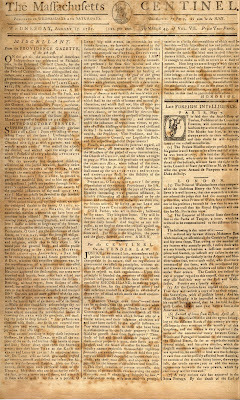 The Massachusetts Centinel, August 15, 1787, p. 1. 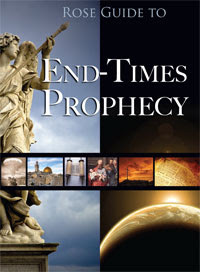 End Time Study is fascinating to some, overwhelming to others and avoided by many. This is an area filled with opinion and surprisingly many Christians do not know the scriptural passages that are key to forming and understanding on these issues. So Why Don't Christians Know the Scriptures about the End Times? Jesus talked a lot about the end of time and his second coming. These are key teachings that every Christian should know. So why don't they? Perhaps the topic seems too complex or too confusing. And that's a shame because it doesn't have to be. Over the next several days we will discuss these passages so that you can be better equipped in your daily life with God. Rose Guide to End Time Prophecy is an easy-to-understand overview. It helps you understand key portions of Scripture and explains different ways that Christians have interpreted them. Simple charts and illustrations help you see the whole picture.